Mix thinly sliced onions with seasoning in a bowl & allow the water in the onions to come out by resting for 5 min. Add in the gram flour, chilli powder & ginger/garlic paste,curry leaves & mix it through to make a strong coat over the onions. Heat oil in a pan & deep fry it until golden brown. Serve hot with any kinda sides like mint chutney, ketchup or anything which suits the taste. Very nice, this has always been my fav snack. Love it. you didn't add any water in the batter right? that's y it has come out so crisp. super. That looks fabulous.. i usually add rice flour too. Very crisp, i don't add GG paste should be aromatic! wow..want that plate of crisp pakoras..
Lovely, very crispy, just the way it should be. onion pakodas our my fav. specially on a rainy day. urs looks so crisp. Wow iam drooling over. Tea time here dear. Can i have some to go with my tea? Looks crispy and delicious. A very good tea time snack. That looks crispy and crunchy! very nice, is there any competition going on for pakoda. 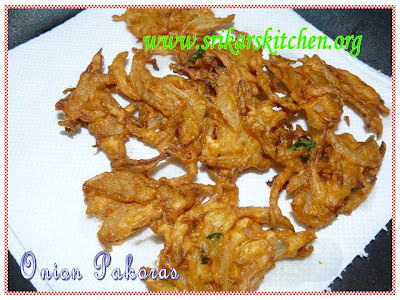 Just had a look at onion pakoda in lakshmi's blog too :). we had this on sun night with tea. delicious with tea. Wonderful to eat in this cold climate.